The 2009 NMC Symposium on New Media and Learning, the thirteenth in the NMC’s Series of Virtual Symposia, will explore the impact of new media on teaching, learning, research, and creative expression, especially in higher education. The NMC have just advised that my presentation proposal has been accepted. Drawing together the established wisdom of educational drama, applied theatre and “situated role”, this session will examine the benefits of creating socially driven learning activities inside 3D MUVEs. 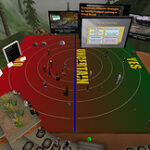 Role-played learning activities in 3D MUVEs can be framed as an “active-inquiry process”. This session will propose and test some effective forms and conventions to frame inworld roleplay as purposeful collaborative learning. All finished. Went quite well – as usual too much planned to squeeze into the session. Seemed to be well received. The session will available as a .mov from the NMC in the next day or so. Good crowd for the end of an event… No time to go the Irish Pub with the rest of them though.